Dee-Jay’s Signature Series – Pleasure has just started her show career. Pictured here taking her first points the 2nd time in the ring. She will continue to be showed in 2009. Ch. 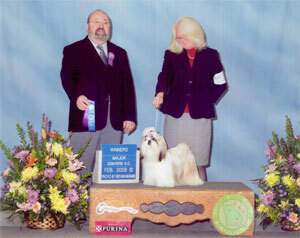 MiOwn Dream of Glory - Our newest 2008 champion. She Finished in 6 shows. 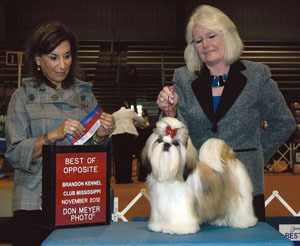 Pictured here winning a 4 point major at her first show in Forest Park, Georgia. Glory is a very sweet and loving girl. She loves to play with the girls and run in the yard. If you do not play with her she will pinch you to let you know she is ready to play. Ch. Majesty’s She is not Ordinary – Orvie came to visit us to be shown. She has since decided that she wanted to stay here in Georgia for a while with us. 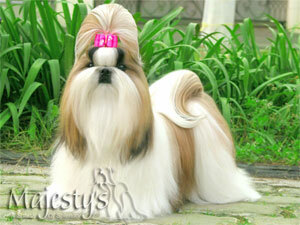 Jesslyn of Majesty’s Shih Tzu agreed to allow her to live with us for awhile. Ch. Dee-Jay’s Perfect Harmony – Her name says it all. Harmony was the perfect girl. She loved everything and everyone. Her willingness to please was always so apparent. 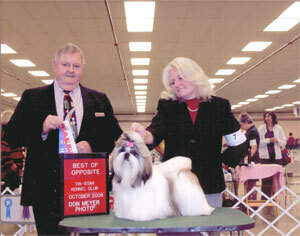 She finished her career with a “Best Of Breed” from the classes. Along with a Group 1. Ch. 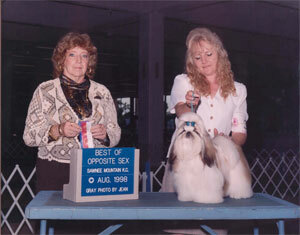 Dee-Jay’s Memory Maker – Patches, Ms Snob herself doesn’t think she is a dog. She thinks our home rotates around her. If she wants a cookie we are to go get it and bring it back. 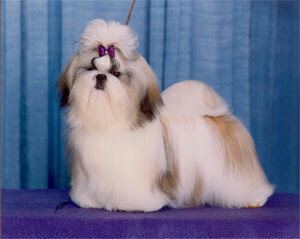 No other Shih Tzu can sit in our lap while she was in our lap. If she wants in our lap the others had to get down. Ch. Dee-Jay's American Girl - Baby Girl, Needless to say Baby Girl is a spoiled girl. Her and her mother Rain thinks our house should rotote around them. She is almost as snobby as her mother.